The Coosawattee Foundation was created in the mid-1980's as a means of focusing attention and resources on the problems of identifying and protecting former Native American occupation sites in the southeastern United States. 1987- The foundation began public education programs in order to educate the residents of Northwest Georgia about the presence and importance of archaeological sites in the area. The Foundation formed a relationship with landowners in the Coosa River drainage in order to insure that looting activities could be detected and reported. 1988- The Foundation raised funds and sponsored a summer field school at The Leake Site in conjunction with the Department of Anthropology at The University of Georgia. 1989- The Foundation Sponsored a second year of excavation and laboratory work at The Leake Site. 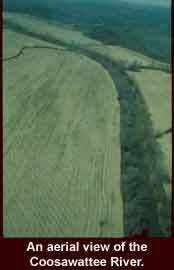 The Foundation won a grant from the National Park Service of the U.S. Department of Interior to conduct archaeological surveys of the Etowah River Valley near Cartersville, Georgia. 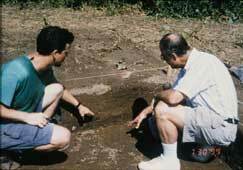 1990- The Foundation completed a third year of excavation and laboratory research at the Leake Site. This project resulted in the discovery of ceremonial mounds dating to 100A.D. Research at the same site also yielded important new information about the presence of the Spanish expeditions of Hernando DeSoto and Tristan De Luna and the resulting demise of Native Populations. The president of The Foundation served as chairman of the DeSoto Trail Commission. This year marked the 450th anniversary of the DeSoto expedition through Georgia, and the Commission was assigned the task of designating important points of interest along the trail. 1991- The Foundation received another grant from the National Park Service to conduct an additional archaeological survey in the Etowah River Valley. The first survey revealed an unexpectedly heavy density of sites per square mile. The second survey was deemed necessary to cover other areas of the valley not included in the first survey. The Foundation began the important work of working closely with Native American groups in Georgia to try and find legislative methods of discouraging looting of Indian burials and occupation sites. The Foundation participated in the Cherokee Indian Homecoming at New Echota and also in the South Carolina Archaeology Week. 1992- The Foundation began a second field school with the University of Georgia. This excavation was co-sponsored by the National Geographic Society, and was located on the King Site, situated on the Coosa River near Rome, Georgia. The Foundation took a leadership role with American Indians in drafting and passing landmark legislation in Georgia to protect burial sites and other archaeological sites in the state. 1993- The excavation and laboratory work was concluded at the King Site. The site had the distinction of being the only completely excavated site from the early European contact period, and thereby provided significant information about the devastating impact of Europeans on native cultures of the 16th Century. In other research activities, the Foundation sponsored academic research regarding the early historic period of the Creek Indians in Georgia. The Foundation also formulated a plan under which the Gordon County Commission applied for funds from the U.S. Department of Transportation for the construction of multi-use trails that link important historic and prehistoric sites in the county. The plan, submitted under the TransportationEnhancement Activity provisions of the ISTEA program, received the highest ranking among 64 projects reviewed by the Georgia TEA Panel, and the project received an award of $ 1 million. As part of its increasing commitment to assist American Indian people with various projects, the Foundation sponsored the acquisition and distribution of more than one ton of clothing to children at the Rosebud Sioux Indian Reservation in South Dakota. 1994- The Foundation assisted the University of Georgia Department of Anthropology in use of a GIS computer tool for sophisticated mapping and analysis of information gathered from the King Site. The Foundation arranged and donated the rental of sophisticated laser mapping equipment for a construction project on the mounds at the Etowah Indian Mound site. The excavations revealed very elaborate construction techniques of the original ramp and steps to the mounds. The Foundation assisted the Society for Georgia Archaeology in sponsoring the first "Georgia Archaeology Awareness Week". The Foundation began the start-up phase of an educational project called the "River Corridors Initiative" which has since outgrown our sponsorship and moved on to be funded by other larger environmental groups. In the Fall of 1994, the president of the Foundation was asked by Governor Zell Miller to serve as a private citizen on a commission of legislators and state agency directors to define how best to design, build and operate a state museum of Georgia history and prehistory. 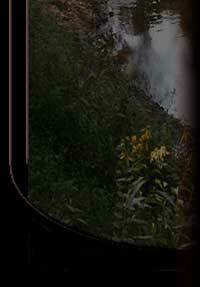 1995- The Foundation returned to some basic research activities on the Coosawattee River in Gordon County. The Foundation also assisted in the investigation of human remains found in the Calhoun, Georgia area. This resulted in the Foundation instructing the Georgia Bureau of Investigation in the discovery and excavation of human remains. The Foundation leaders were asked to participate in two committees of the Atlanta Regional Commission's planning project called Vision 2020, a planning effort to help define how the Atlanta region will grow over the next 25 years. 1996- The Foundation continued to support and participate in the "River Corridors Initiative". In a similar public education project, the Foundation was a major sponsor of Georgia Archaeological Awareness Week. In Gordon County, the Foundation assisted local residents and the New Echota State Historic Site in opposing the location of a proposed truck stop near New Echota. The Foundation also worked with residents and county officials to propose historic zoning within the county. The president of the Foundation traveled to Rwanda in June of 1996 to assist the Carter Center and USAID in the creation of a computer data base that would document the 80,000 people in jail in Rwanda charged with complicity in the crimes of genocide that resulted in the murder of more than 1 million people in that country in 1994. In conjunction with another organization, the Native American Consortium, the Foundation hosted at the Carter Center a historic meeting of tribal leaders from 26 American Indian tribes from all parts of the United States. 1997- Together with the Southern Appalachian Forest Coalition, the Foundation sponsored large meetings in Northwest Georgia of U.S. Senate and Congressional staff members, state agency directors, local government officials, Chamber of Commerce officers and regional tourism professionals. The purpose of these meetings has been to educate these leaders about the value of natural and archaeological resources in the area and to encourage their participation in programs aimed at protecting and promoting these resources. 1998- Present The Foundation began working as co-producer of a documentary film project, "Our Landscapes", which tells the story of individuals who have powerful attachments to the land and are striving to preserve a landscape or way of life associated with the land. The president of the Foundation was appointed by the Governor of Georgia to serve as a member of the Board of Natural Resources which oversees all functions of state government related to environmental protection, historic and prehistoric preservation, state parks and recreation, coastal resources and wildlife management. Also in 1998, with a substantial grant from the Educational Foundation of America, the Foundation hired Dr. John Worth as its first full-time staff member in order to move structured educational programs forward with new ideas and energy. CFI headquarters were moved to the historic Crane Eater house on Redbud Road, and a long-term education and research project were initiated at the nearby Thompson archaeological site. In addition, during 1998 and 1999, the Foundation also hired Ms. Dea Mozingo in order to expand its program capabilities. Between 1999 and 2001, CFI also worked with Chieftains Museum in Rome, Ga. conducting both archaeological survey and a range of educational programs for public and school audiences. In the past three years, the Foundation's new educational initiative has been extremely well-received by educators and the general public. Since 1998, more than 6,000 youth and adults have participated in CFI educational programs. Of the grand total of more than 11,200 hours of instruction received by students, more than 40 percent were logged in the field in hands-on archaeological research.